Wabash recorded six sacks and held Allegheny to 56 yards of total offense in a 54-0 road victory for the Little Giants Saturday. Wabash ran for seven touchdowns in the shutout. The ninth-ranked Little Giants ran for 290 yards and threw for 239 in the lopsided North Coast Athletic Conference opener. Connor Ludwig paced the Little Giants defense with two sacks and three tackles for loss as a part of his five tackle effort. AJ Clark led the team with eight stops, including two tackles for losses totaling four yards. 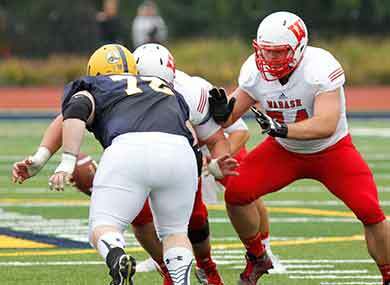 Wabash held the Gators (0-3, 0-2 NCAC) to minus-36 yards rushing on 25 carries. Allegheny completed 12-of-26 pass attempts for the majority of their yards, but also tossed three interceptions. CJ McMann returned the last pick 56 yards to set up a one-yard Matt Gibson touchdown. Delon Pettiford stepped in front of a Logan Lee pass in the second quarter that Michael Putko converted into a score on a six-yard run. Eddie Cmehil hauled in a pass tipped by Austin Brown for the third pick. Wabash shut out the Gators for the third meeting in a row. Wabash controlled the game from the outset. After forcing the Gators to punt after three plays to begin the game, the Little Giants scored on their third offensive play. Mason Zurek broke through the Allegheny defense and raced 34 yards to put Wabash up 7-0. Zurek finished with 124 and four TDs in 20 rushing attempts. Shamir Johnson added 88 rushing yards and one TD. Conner Rice drew the starting assignment at quarterback for the first time in his career. The left-handed junior threw for 178 yards on 11-of-15 attempts. Putko added 61 yards on 3-of-6 passing. The Little Giants entered the game without a single play of more than 29 yards, but quickly topped that on their third offensive play. Tom Garrity and Sammy Adams caught passes of 35 and 32 yards respectively from Rice in addition to Zurek’s opening score. Wabash amassed its highest offensive yardage total since a 604-yard effort last year at Kenyon despite changes along the offensive line. An injury to Wes Brown two weeks ago at Hampden-Sydney moved Deryion Sturdivant from left tackle to right tackle. Tim Leath moved from guard to tackle, while Jordan Culp took over at guard for Leath. The unit kept both quarterbacks upright all game, not allowing a sack in 22 pass attempts. “We had the bye week after the Hampden-Sydney game and then a full week to prepare for Allegheny,” Raeburn said. “Our offensive line has had plenty of time to work together after Wes went down with an injury. He went down early in the Hampden-Sydney game so this offensive line got to play together a lot in that game too. I don’t think there were any issues from a communications standpoint. The more they play next to each other the more comfortable they will be. 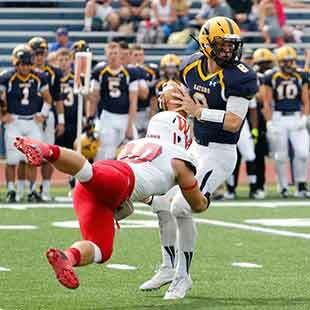 Wabash held Allegheny’s top defensive player, Nick Murgo, to six tackles. He entered the game averaging 14-1/2 per game after recording 107 total last season to earn NCAC Newcomer of the Year honors. Marcus Davenport led the Gators with 10 tackles. The Little Giants move forward to prepare for their annual showdown with Wittenberg University. The matchup between the two teams predict to battle for the conference title in the preseason coaches pole square off in Crawfordsville this Saturday. Raeburn sees no need for major adjustments heading into the contest. The focus is set on continuing the same type of improvement from his team that showed in the win over Allegheny. Kickoff versus Wittenberg is set for 1 p.m. with Senior Day festivities scheduled to begin at 12:40 p.m.